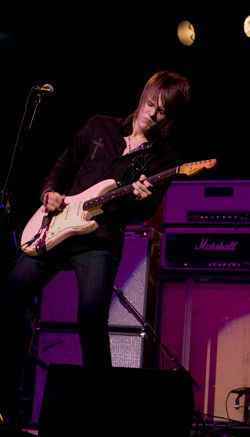 Tyler Bryant is in the middle of a passionate relationship. It�s all-consuming. It gives meaning to his life. It brings joy and hope to his everyday existence. 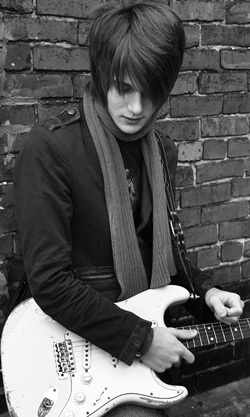 Tyler Bryant is in love� with his guitar. Seriously, Tyler is never far away from his shell-pink 1960 replica Stratocaster. He refers to it as an attachment of his body. A creation of the folks at Fender, it was built to his personal specifications, complete with the wear and tear the instrument would have endured after 49 years of string-bending. 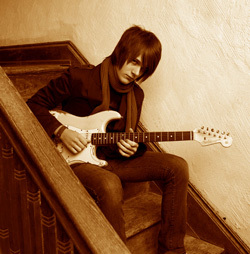 See, Tyler has a long-standing love affair with guitars. Simply stated, it was a relationship that was meant to be. The resident of Honey Grove, a small town in the northeastern corner of Texas, received his first acoustic as a Christmas present at the tender age of seven, and four years later sacrificed his own dirt bike, selling it in order to purchase his first electrified axe. While still in elementary school, a visit to a Paris, Texas music store introduced Tyler to Roosevelt Twitty, a 63-year-old bluesman and Paris native who saw the youngster�s talent, and before long, the duo was making the Dallas area their musical playground while jamming at parties, clubs, and benefit events. While in high school, Tyler immersed himself in the instrument, learning everything possible recorded by blues legends Lightnin� Hopkins and Muddy Waters, then absorbing the work of Jimi Hendrix, Jeff Beck, and Stevie Ray Vaughn. Now, let�s fast forward to 2007, when Tyler (And his guitar) were the recipients of the Robert Johnson New Generation Award, given to a promising artist by the Robert Johnson Blues Foundation. Yes, that Robert Johnson. Oh, and during the summer of 2007, Tyler was invited to Chicago to perform at the Crossroads Guitar Festival, a little get-together led by Eric Clapton. We all remember Clapton. He had a couple of hits. Most recently, Tyler completed (Along with his guitar) a co-starring role in �Rock Prophecies�, a film about legendary rock photographer Robert Knight. The film, which premiers March 27th at Dallas� Magnolia Theatre also stars Slash, Jeff Beck, Carlos Santana, and Steve Vai. Finally, a recent recording session resulted in �Bittersweet�, Tyler�s newest song produced by Kevin Shirley, a man who also produced a fairly well-known rock outfit we all know as Led Zeppelin. That�s a pretty impressive resume�. Still, Tyler and the shell-pink love of his life have a ways to go. Actually, he�s got quite a few good years left to make music. See, he�s only 18 years old. He�s good. Scary good. Recently, Tyler sat down for a visit with Americana Music Times, and yes, he brought the Strat. And while our conversation ranged from topics such as Santa Claus, Stevie Ray Vaughn, and being the worst musician in the room, Tyler couldn�t keep his hands off his beloved 6-string, and the music was worth every note. You�ve been called old-school. Pretty interesting for an 18-year-old. My CD collection was so old school that it wasn�t even funny. My grandma was like, �Tyler, you need to get hip.� I was listening to old school blues stuff like Lightnin� Hopkins, all the Motown stuff, and Stevie Wonder. Don�t get me wrong, I love some new music, but I�m so about old school. It just seems like it was real. They weren�t trying to make a song to sell, they were just trying to make a good song. Music was musical. There was something back then that�s not really being done much today. There is so much good music out there right now, but there�s a lot that sounds like the fast-food industry. Talk about your pink Stratocaster. It looks old, but you say it�s really not? Fender said I�m the only artist they�ve ever had that�s asked for one. They basically said, �Hey, what�s your dream guitar? What do you want?� I wanted a 1960 replica Stratocaster, shell-pink, with rosewood bore. I sent them all the measurements, because I have an original 1960 Stratocaster. I sent them pictures of how I wanted the wear to look, and they built it and turned it over in about a week and a half. There was one thing that wasn�t right about it. The neck still had too much lacquer on the back, and it wasn�t worn down enough. My favorite thing about my old Strat was that the finish was worn down on the neck so my hands just slid across it. So, I went out to the Fender factory and they took care of that. Man, it�s like a piece of my body. It�s my favorite guitar in the entire world. I�m actually holding it right now. (At this point, Tyler�s playing bleeds through the phone connection) It�s definitely always close by. You�re from Honey Grove, but are currently living in Nashville. Talk about how you got there. Did you experience a moment when you knew playing music was your destiny? Stevie Ray Vaughn�s a huge influence on me. He changed my life. I remember getting his Live at El Mocombo DVD. I think every young guitar player goes through a time when they want to be Stevie a little bit. I got it on Christmas night when my grandma gave it to me. I went home and I watched it. That�s when I found out that Santa wasn�t real because I wouldn�t go to sleep. I think was 9 years old. People often compare you to Stevie Ray Vaughn. What�s your opinion? You mention Roosevelt Twitty as your main influence. He sounds like a special guy. Watching your live videos, playing in front of a crowd seems to transform you. During the past few months, you�ve had sessions with some world-class musicians. Anton Fig (Drummer from the Late Night With David Letterman Band) played on the song �Bittersweet� that�s on the MySpace page. He was the coolest guy ever, and was telling me all these stories. Also, the film (�Rock Prophecies�) needed a 7-minute song for their credits, and so I wrote the song �Who I Am.� Then, Abe Laboriel, the drummer from Paul McCartney�s band came in, and Carmine Rojas from Rod Stewart�s band came in on bass. We set up in the studio and I played the song for the guys acoustically one time. We lit like 300 candles and just went for it on the first take. I probably mess up more when I�m playing with those guys, but they push me. Sometimes it�s good to be the worst musician in the session, because it definitely pushed me to try new stuff that I�d never tried before and to get some really cool sounds. You�re in the process of writing songs for your next CD. What are you hearing? The new album is going to be right, I know that. I�m not dissing my first record, but that was recorded in 2 days. I had no songs at all. I called up these 2 musicians that a friend of mine knew and said, �Hey, I�ll pay you guys $200 to come out and play on a record with me.� They thought they were going to do a single song. We cut 11 tracks in 2 days. We did it on analog, so it was all a live-in-the-studio thing. I�m spending some time on this one to insure my songs are undeniably good. We�re going to bring back guitar solos, and we�re going to bring back some old-school stuff. I want it to be so slamming, soulful, and rockin� that you start the involuntary head bobbing. It�s like Albert King said about blues, �If you�ve got a soul, then you can feel this.� I think that works for a lot of music. I want it to be undeniable and automatically make you feel something. You know, the Black Crowes did that with �Remedy.� That�s where I�m going. You�re co-starring in a movie along with Slash, Jeff Beck, and Carlos Santana. What goes through your mind seeing yourself on the big screen? That�s the biggest honor for me, and I feel so blessed to be in there. It feels pretty unreal whenever I see the film, and I�ve seen it a few times now. I enjoy seeing myself in there, but every time my parts come up I cringe and think, �Man, Jeff Beck�s gonna see that.� He�s one of my all-time favorite guitar players ever. It�s the best honor ever to be in that film. You�re 18 years old. Where do you go from here? I just want to come out with some blazing guitar, just some great rock �n roll with a really soulful vibe to it, and take some of that blues influence and add it to the mix. I don�t necessarily want to make a blues record, even though that�s where I come from. I just wanna rock.